Well, my design wall is packed up, along with several boxes of my much loved fabric, and waiting for the day when we are able to add on to our new and very humble little home. Whew, I am happy to say that as of last weekend we are all moved in to our new space, the one I talked about here!! Many thanks for all the kind words of encouragement and support for this move. I am so very glad to have the move behind us and be able to get on with making it our home! Thanks to my Home Sweet Home board on Pinterest I have been able to collect a tons of decorating ispiration and tips. I cannot tell a lie however, it is SMALL! I managed to claim a tiny corner in the main living area for my sewing space. 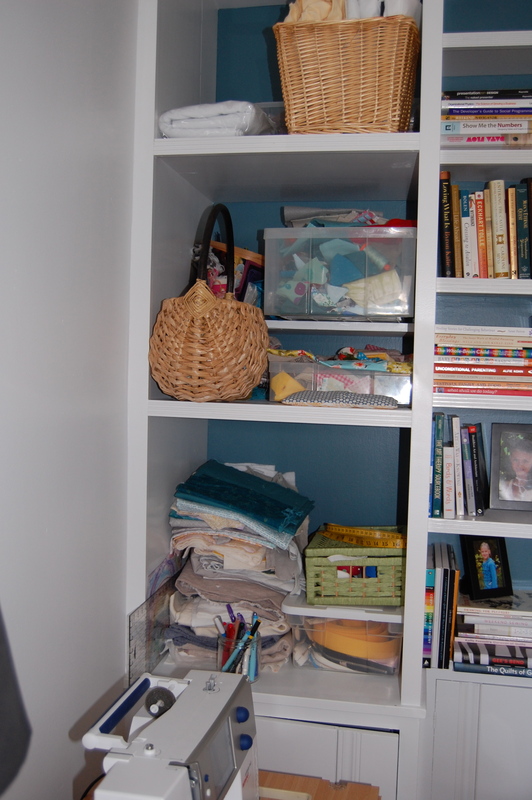 I am grateful for the built in shelving that allows me to tuck things away to a certain degree and for the ability to be in a beautiful, bright room in the middle of all the “action” while I sew. Which means some multitasking- “watching a movie with my girls AND sewing! Speaking of sewing, I haven’t actually sewn anything yet in this space. It is obvious to me that my sewing habits will have to change as I have no cutting table (I’ll use the floor when necessary), no design wall and no place for a “pressing” table!!! I see more pouches and bags, sweet little girl clothing and perhaps some very free form, small wall hanging pieces in my future (although I must admit, I have a large size lap quilt ready to sew together-more on that another day). Oh and my laptop will also need to share a space with my sewing machine now, which will hopefully equal more frequent check ins on my blog. I have no choice but to see the bright side of all this and learn to embrace minimalism in a big way! 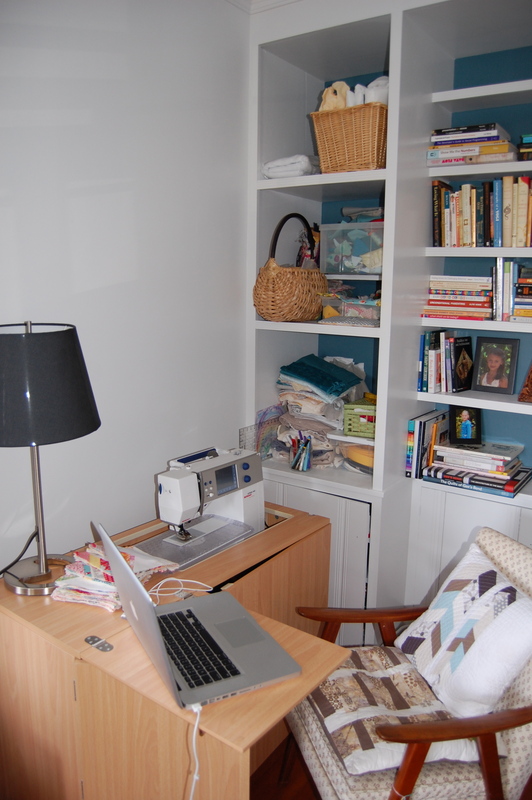 I imagine you creating lovely things in your new sewing nook Karen! And I’m glad that you’ll share them on your blog. Hope to see you soon…. and I owe you an email. Got three nasty bugs after the holidays and am just getting back on my feet. I’m glad you still have a space to call your own. Can you imagine the withdrawals? Please consider a swivel chair for sewing. It will give you more endurance for those long piecing/machine quilting sessions as well as save your back.